At TermLife2Go, we’ve got your back. We believe in saving you time, energy, and money while you’re looking for life insurance. We’ve done a lot of the legwork for you, so you can easily research and compare some of the top life insurance companies in the United States. Because we’re independent insurance agents, our goal truly is to find the best life insurance policies for you from the top life insurance companies—not push you into the wrong plan. The last thing we want to do is offer you unobtainable life insurance quotes or life insurance policies that aren’t right for your needs. If you have special requirements, if you’re looking for whole, universal, or term insurance, or you’d rather skip a medical exam, we’ve got options for you! Your life insurance plan shouldn’t be one-size-fits-all, and you need someone in your corner to easily compare providers. We work with dozens of top-rated life insurance companies. The list of companies we focus on can change at any given time, depending on which companies are currently offering the best policies and pricing. That means we compare multiple life insurance providers for you, so you can get the best life insurance company recommended just for you, based on your specific needs. Don’t wait! Check out the top no medical exam companies. Our #1 priority is to look at the best life insurance companies and find a life insurance plan that meets your needs at the best price! That means we tailor our life policies specifically to you, because no two clients are alike. Let us leverage our expertise for you and see if we can save you thousands of dollars on life insurance while getting you the best insurance coverage possible. Another year has gone by and we have seen some major shifts in the life insurance marketplace. For example, certain insurance providers, such as Genworth Financial and MetLife no longer offer individual life insurance plans. However, you’ll still find plenty of options to choose from, ranging from AIG, Assurity, Banner, MetLife, Mutual of Omaha, and more. With the shifts in the last year, TermLife2Go remains committed to providing access to the best life insurance companies and policies in the U.S.A. so you can find life insurance coverage that meets your unique need, health and lifestyle. At TermLife2Go, we are independent agents, rather than captive agents. What this means is we are free to choose from among the top carriers, instead of being captive to only ONE company. Many of the larger agencies out there only represent a handful of companies. However, we have access to dozens of top companies, with a pool of more companies to draw from if necessary. Having many life insurance companies companies to choose from allows us to offer the right company to our clients, instead of the company that offers us a “sweet” deal. It is this independence that allows us to best serve our clients, saving you time and money when you’re looking for the right life insurance policy. Which company offers the best life insurance in 2019? Save up to 70% on your life insurance! What they are not telling you is the comparison is with an inferior product from an inferior company. Because of the tough competition among the top insurance companies, life insurance rates among the best companies and policies are very competitive. Be aware that just because a company offers 70% off of your life insurance, that doesn’t necessarily mean the discount applies to you. You see, in order to actually receive that quote you must qualify for it. And this is the key. Carriers give out different health rate categories depending on a clients health and lifestyle. Our goal is to align each client with the company that suits that specific client’s unique need, health and lifestyle so that each client has the greatest opportunity at getting the top health category. In this way, our clients have the best shot at getting the best price for life insurance coverage specific to him or her. And don’t neglect preparing for the life insurance medical exam! A few tweaks to your daily routine can save you thousands over the life of your policy. No two companies and no two clients are the same. There is no one size fits all company. Instead, there are many different companies all vying for your business. The key is to choose the one that will give you the best shot at getting the best life insurance policy. Apart from getting acquainted with the best life insurers, you need to also be familiar with the different types of life insurance policies.There are two main types: term life and permanent life insurance. Term life is pure insurance policy, with no cash value, and you’ll find it’s initially the most affordable life insurance available. There is a lump sum death benefit, paid to your beneficiary income tax free. You can choose various term insurance lengths, starting with annual renewable term (1 year), 5 year, 10, 15, 20, 25 and 30. Once the term expires, the term insurance policy can be renewed annually, but be forewarned that your cost of insurance will go up every year. Alternatively, some companies lower the death benefit rather than raise the premiums. You can also convert your policy to permanent life insurance coverage before the term policy expires or before a certain age, typically age 70. A permanent life insurance policy lasts your entire life. It is also known as cash value life insurance. The policy builds cash value, that you can access with life insurance loans or withdrawals. Cash value life insurance pays a tax free lump sum death benefit to your beneficiary. Life insurance loans are income tax free and the cash value growth is tax deferred.There are many different kinds of permanent life insurance policies and different types of life insurance coverage. Although term life and permanent life insurance policies are the two main ones you need to know, you might have also heard a few specific types of insurance policies and coverage. With a whole life insurance policy, you lock-in a consistent premium over time. Universal life insurance coverage is unique because it allows the policyholder to decide how much money to put towards a death benefit and how much to put towards the policy’s cash value (under specific guidelines). A survivorship life insurance policy allows you to set up life insurance so that more than one person is covered. No medical exam insurance is available to individuals who do not wish to undergo a medical exam as part of the process for obtaining life insurance. Final expense insurance or burial insurance can be set up by individuals between the ages of 50 and 85 who would like to cover the cost of burial and funeral expenses. We typically recommend A.M. Best Companies rated excellent (A to A-) and above. Occasionally, we will recommend life insurance companies with good ratings (B+ to B++), which A.M. Best believes have a good ability to meet ongoing insurance obligations. We try and list the rating of each company but if you are unsure please feel free to ask us. What Life Insurance Company is Best for Me? There are two main types of companies, mutual and stock. Mutual insurance companies are owned by the policyholder and stock companies are owned by the stock holders. Neither of these types of companies is better than the other, per se. However, for particular products, such as dividend paying whole life insurance, a mutual company will often be the better choice primarily because the of annual dividends returned to policy holders. When you’re trying to decide which life insurance company to apply with, it is important to understand what SHOULD be happening during your initial life insurance interview. Nearly every term life vs whole life insurance application will share many of the same questions. Help determine which life insurance company will be the right one for you! You can also see a complete list of our other life insurance reviews by clicking here. AIG’s life insurance brand is American General Life Insurance Company (AGLA). AGLA is the right choice for many because the company is the “jack of all trades” in the insurance industry. This is demonstrated by the Company’s flexible (i.e. loose) underwriting, competitive pricing which is usually well below the industry average, and they have exceptional customer service. The following strengths help AIG rank as one of the top companies. Great carrier for higher risk applicants, such as those looking for diabetic life insurance. You can tailor your term to a specific length from 15-30 years, such as 16, 17, 18, 19, etc. Excellent living benefit riders, including an accelerated death benefit rider free of charge. An ADB rider works like this: If you are diagnosed terminally ill, you can receive a portion of your death benefit while you are still alive, which can be used to help pay bills, hospice, or whatever else you need it for. AIG offers some of the lowest rates on Guaranteed Universal Life insurance (GUL) to age 121. This is a fixed premium policy that becomes fully vested at age 121. If you die before age 121 it pays out the full face amount. If you live beyond age 121 then you can cash the policy in for the full face amount. This is a great option for business succession planning such as funding a buy-sell agreement with life insurance. You can also add a child life insurance rider to your policy which covers all your kids at one set premium rate. Annual quotes are based on a male at a preferred plus rate as of February 2017. Rates are for informational purposes only, are subject to change and must be qualified for. No medical exam required but you must answer some questions and pass MIB, pharmacy and MVR checks. This is a fully underwritten guaranteed premium term life insurance policy. Face amounts: $350,001 and up. Ages 66-74 start at $100,001 and up. Optional 20 and 30 year Return of Premium Benefits Rider. This is a fully underwritten whole life insurance policy with level fixed premiums throughout the life of the policy. As with any whole life insurance, the policy builds cash value and will last the rest of your life as long as premiums are paid. Available ages are from 0-85 years old in face amounts starting at $10,000 on up. What would a top 10 list of the best life insurance companies in the United States be without Banner? Owned by parent company Legal and General, Banner Life is Legal and General’s flagship life insurance company in America and one of our favorite carriers to write, not only because of their A+ financial stability rating, but also because of their exceptional service and price. Great carrier for higher risk applicants especially type 2 diabetics and type 1 diabetics. Banner Life policies are renewable and convertible to the age 95 (most competitors only allow policies to be renewed to age 90). Excellent pricing on table rates (i.e. high risk life insurance rates below standard). Banner Life offers an accelerated death benefit rider free of charge. 20 year term life quotes are based on a male with a Table B or Table 2 rate class as of February 2017. Rates are for informational purposes only and are subject to change. MetLife is the largest life insurance company in North America for actual in force business. The Company also boasts a stellar reputation due to the company’s financial strength and great customer service. When the company is competitive for price, they’re usually a great fit. As of March 2017, the retail side of MetLife will now be sold under Brighthouse Financial. MetLife choice for active military personnel. MetLife must also be considered for any type 1 diabetics. Marijuana life insurance underwriting experts. One of the best niches is the Company’s Fit Underwriting Credit Program which benefits clients who normally would be rated below standard. Good life insurance policies usually have some sort of healthy credits program, and MOO is no exception. The Company offers 14 lifestyle and health credits. If a client possesses characteristics identified as three or more of the credits then the client will be eligible for a better rate class, up to two table ratings. Simplified issue, Term life, Universal life, and Whole life insurance products are available. One of the most popular policies is the company’s Living Promise Whole Life. North American Company is quickly rising in fame, offering some of the top rated best life insurance in 2017. And don’t let the name fool you, just because the name North American Company for Life and Health Insurance doesn’t roll off your tongue doesn’t mean you shouldn’t consider them when deciding who you want to apply for coverage with. As a privately owned insurance carrier, North American Company has consistently demonstrated that, through sound investments in secure and stable assets, it can maintain the highest rating in financial strength and stability. Great pricing for specific age brackets. term life (including simplified issue), universal life and indexed universal life. No top 10 life insurance companies in the United States list is complete if it does not include Protective Life. You just gotta love a company whose motto is: “Do the Right Thing, Serve People, Build Trust and Simplify Everything.”And they’ve been doing it that way since 1907. Now throw in that they are nearly always around the lowest priced term life insurance carrier in the industry and it is difficult to think of a situation when Protective shouldn’t at least be considered as the best choice. Guaranteed Universal Life Insurance experts. The company offers GUL in the form of 10, 15, 20 or 30 year term options. Once the policy term expires the coverage continues at the same price with a decreasing face amount. Highly competitive pricing. Typically one of the most affordable—if not the most affordable option available. Income Provider Rider: optional rider that further decreases the life insurance premium because it pays out the death benefit over a period of time rather than lump sum. This is great for parents who do not want their children to receive a lump sum, but would rather spread it out up to 30 years. Monthly rates are based on a 20 year term for a male at a preferred plus health class as of February 2017. Rates must be qualified for and are subject to change. Prudential, Pruco, or, “the Rock”, is one of those fantastic companies that everyone’s heard of, everyone knows, and everyone feels comfortable working with. Non U.S. Resident Life Insurance. Prudential will use an applicants true age or actual age in determining premiums rather that rounding up or down based on which birthday is closer to the date of application. This is a common practice within the life insurance industry known as “insurance age” vs “actual age” where most companies will date you one year older if you are six months past your last birthday. The self proclaimed “No Nonsense Life Insurance Company”, SBLI, in our experience, is just that. Known throughout the industry as being one of the more customer-centric life insurance carriers out there, SBLI seems to have used its smaller size to allow it to provide great customer service, and the lowest life insurance rates in many categories, particularly for those willing to pay on an annual basis. SBLI’s accelerated underwriting term policy is cutting edge. Price — particularly when premiums are paid annually. SBLI also offers a annual renewable term (ART) product for those who are looking for a shorter term such as those seeking to cover an SBA loan with life insurance. Bookmarking the end of our top ten life insurance companies list is Transamerica. Famous for its trademark Pyramid, Transamerica life insurance is definitely a top “go to” company, especially for older clients. The company’s term life insurance coverage comes in three flavors: no medical exam term life with a face amount limit of $249,999; term life with return of premium, and fully underwritten term life insurance policy with terms of 10, 15, 20, 25, and 30 years. Transamerica also offers whole and universal life insurance. Excellent life insurance for seniors. Great living benefits life insurance option. We represent dozens of the top life insurance companies and we’re constantly reviewing companies based on pricing and underwriting criteria so that we’re sure to stay on top of any changes within the industry. Today’s top ten life list is not necessarily going to be the same down the road. Which is why it is important for you to choose a life insurance agency that is not bound to any company and whose main purpose is to find you and your family the coverage you deserve—an agency such as TermLife2Go. The two life insurers that currently offer the best life insurance for diabetics out there right now are American General (AIG) and Banner Life (Legal and General). Both of these carriers made our top 10 list due to their great underwriting, which is often more liberal than other top life insurers. And both of these insurance carriers work well with applicants who have either type I or II diabetes. Once again, Banner Life Insurance Company comes in as one of the top life insurance companies for smokers and tobacco users. If you smoke and need insurance coverage, Banner is a great choice, although Fidelity Life, North American, Assurity, Sagicor Life Insurance Company and Transamerica may also be competitive options at times, particularly if you are considering something other than a term insurance policy. For example, if a 30 year old male qualifying for a preferred tobacco rate class wanted the most affordable life insurance coverage for smokers, he would want to choose Assurity. A $250,000 10 year term policy at a preferred tobacco rate with Assurity is $27.41 a month, a 10% monthly premium savings over Banner Life. So here is something interesting, certain amounts of cigar use is permitted with certain carriers. If you smoke an occasional cigar, Pruco Life Insurance Company is one of the best life insurance companies to go with. However, other carriers may beat Pruco out on price at times, so it is important to check the alternatives. Interested in more underwriting niches? You can check out our complete list of pre-existing conditions here or simply give us a call and let us direct you to the right company for you based on your specific health and lifestyle. Level term life insurance offers death benefit protection for the term of the policy. Term policy lengths vary but you can find life insurance terms from 1 year, such as annual renewable term, all the way up to 35 year return of premium life insurance. Most term life insurance policies offer a conversion option, that allows the owner to convert all or a portion of the face amount into permanent coverage with no proof of insurability. This is a huge benefit if you need to keep the policy due to changes in your life, or if your health changes and you would otherwise be uninsurable. There are two main types of permanent life insurance: whole life and universal life. Whole life insurance policies last your entire life. You can choose from several different life insurance plans and you can configure your policy to focus on either the death benefit or the cash value accumulation. The advantage of limited pay life insurance coverage is once you fulfill your limited pay requirement period you have paid up life insurance for life. Further, if you have whole life with a participating policy that pays annual dividends, then your cash value and death benefit CONTINUES to grow. Paid up additions is the most popular option chosen for dividends. With paid up additions, you purchase additional paid up life insurance. This allows your cash account to grow and your death benefit. That way your death benefit is at its maximum when that inevitable day arrives and you maximize your estate—and your legacy! Guaranteed universal life (GUL) offers flexible, lower premiums than other permanent policies. The primary focus for GUL on permanent death benefit coverage with limited cash value growth. Indexed universal life insurance (IUL) offers similar premium flexibility but offers higher cash value growth than GUL. The policies cash account is indexed to the market, either the S&P 500, NASDAQ, etc…, and the policy offers a guaranteed floor and has a maximum cap, somewhere around 12-14%. The main advantage is your policy earns a guaranteed positive return, even if the market is down. However, your gains are limited by the cap, so the policy does not participate in huge stock market gains above the cap. Variable Universal Life (VUL) provides similar flexible premiums but with the highest cash value accumulation opportunity due to the cash account being directly invested into the market. As a result, VUL has the opportunity for high returns, but also the opportunity for huge losses, all tied to the performance of the stock market. So what policy should I choose? With so many amazing options from so many fantastic life insurance policies it is hard to say what policy type is best for you. But don’t worry, our team of life insurance coverage professionals are standing by waiting to help you with any questions you have and point you to the best company offering the best policy and plan specifically designed for your needs, goals and objectives. The following list is organized by the Comdex ranking of the top rated life insurance companies that offer life insurance coverage to individuals. The Comdex ranking is a composite that takes the insurance ratings of the different companies and ranks the companies based on financial strength in comparison to the company’s peers. For 2019, the highest rated life insurance company was Northwestern Mutual. We realize this is a lot of information to digest. Here’s the main takeaway: you should choose an insurance agency that works with top-rated, best life insurance companies and policies in the U.S. You need an agency that can help align you with the insurer that will give you the highest likelihood of receiving the lowest rates. And it’s a plus when you can search multiple providers and have them compared for you—all online. So, the key is to find an agency, such as TermLife2Go, that can help you accomplish your goal of getting a top-of-the-line policy, with a top carrier, for the best price, with your unique needs in mind. Our #1 priority is to find you the best company and plan at the best price…for you! That means we tailor a policy specifically to you, because no two clients are alike. 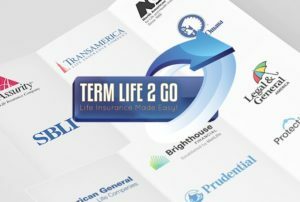 TermLife2Go works with dozens of the top rated companies, let us leverage our expertise for you and see if we can’t save you thousands of dollars on life insurance coverage. If you enjoyed our article, Top 10 Best Life Insurance Companies in the United States, and/or have any questions, please leave a comment below. We would love to hear from you! I am looking for life insurance for my 35yold son who is a smoker. We just buried his twin brother last Friday 5/11/18. He was not a smoker. We’re sorry for your loss. Give us a call at: 888-234-8376 and we can help you find the best life insurance policy for your son. One of our agents can assist you. We’ll have a few more questions in order to find the right life insurance policy. Give us a call 888-234-8376.
also my mom has fibromyalgia and she just turned 65 in October . Do you know of any ins company that cover individuals with cirrhosis due to alcohol? Thank you for your inquiry. In order to properly serve you, can you call one of our licensed agents at (888) 234-8376. Newly married…I’m 44 he’s 54. I would like to take term life out on both of us..would like premiums to stay the same…just need advice and help. Thanks! Best life insurance for me and my husband. I’m 42 and he’s 49. Good health, non smoker. We’ll have an agent reach out to you shortly so that they can gather some additional information that we’ll need before we can determine which life insurance company will be the “best” for you. We’d love to help, we just need to know a little bit more about you before we can start (age, height and weight, etc…). So, when you have a chance, just give us a call! We definitely have some good options when it comes to a participating whole life policy with PUA or Additional Life Insurance riders to help build high cash value rather than death benefit. We will send over an email to you shortly with some more information. Sounds good, we’ll have an agent reach out to you via email or you can simply give us a call when you have a chance. I am a 28 year old in search of life insurance. I recently was approached by a friend who introduced me to a company called Primerica. Our recommendation would be to give them a call, see what they can do for you then give us a call. At the end of the day, only you can decide which life insurance company is going to be the “best” for you! That said however, we feel you’ll be very pleased after you’ve had an opportunity to review all of your options. I am 63 andhave a policy with Protective life to cover a home equity loan if I pass before it is paid off. My domestic partner is on the loan but did not get coverage to protect me. What company is best for me to get a policy on him. I am 22 with a 3 year old. I want whole life insurance with rates that stay the same. Also interested in insurance on my daughter. What is the best option for me. With a high rated company. It sounds like you’ll have plenty of options to choose from we would just need to know some additional facts such as how much coverage you’re looking for? And what state you live in? Among other things, before we could make any responsible suggestions. For this reason, why don’t you just give us a call when you have a chance and we’ll be happy to help you out. Please be on the lookout for an email from one of our agents. They’ll probably have a few more questions for you before we can determine if we will have a good “fit” for you. We do represent companies that offer these types of benefits, the key is knowing which ones you will be able to qualify for. For this reason, we would recommend that you just give us a call when you have a chance and we’ll review these options with you. Is there a waiting period or it starts the first day of payment. It would depend on which life insurance policy you are asking about. Why don’t you just give us a call and we can review all of your options with you. Our recommendation would be to give us a call so that we can see what types of life insurance policies you’ll be eligible for. Just give us a call when you have a chance so that we can learn a little bit more about what you may be able to qualify for. Also, if you’re just “shopping” rates right now, we would encourage you to also look at 15 year term rates as well, since they will sometimes be priced very similarly to 10 year rates (if not actually better). That being said however, we would think that if you live in the United States, it’s probably better to purchase life insurance from a company in the United States. Additionally, you MIGHT NOT be able to purchase life insurance from another country. Is globe whole life insurance good? While we don’t actually sell or offer Globe Life Insurance products, we have found them to be a good company. That being said however, our recommendation to you would be to first see what Globe Life Insurance Company has to offer, then compare them to some of the companies that we work with. At the end of the day, only you will be able to decide if Globe Life Insurance is right for you, we would just love the opportunity to see if we can do better! Please checkout our article on how to find a lost life insurance policy. Hello. My husband and I are having a hard time choosing the right insurance for us. We are both 51 years old.Friends that sell insurance are a bit agressive and we have become overwhelmed. Help! He has HBP/smoker and I have diabetes/non-smoker. Also want to make sure our daughter (18) is okay if something happens to us. Thank you in advance. I am 53, a Navy veteran and single mother of 4 (29, 26, 17, 13), and grandmother of 2 (7 and 4). As part of my 2017 resolution I am looking into buying more life insurance. Although I want to leave something to take care of all my children, 2 of them have autism (high-functioning Aspergers) and I want to make sure that they are provided for but between term, whole and level term life insurance I don’t even know where to start. I also want to invest in protection in case something happens to any of them. HELP!!!!!!!! Please be on the look out for a reply email from us. Also, feel free to call in as we are ready and available to help you in any way we can. What about New York life? Yes, we do like New York Life. You can check out our review of NY Life here. I will turn 65 soon. I want to buy life insurance before i turn 65. I want a strong reputable co. I have a down syndrome daughter who i want to protect. We would be happy to help you out, we’ll just need to learn a little bit more about you and how much coverage you’re looking for before we could get into any specifics. For this reason, why don’t you just give us a call when you have an opportunity and we’ll do our best to meet your needs. Sounds like you have plenty of reasons for looking into purchasing life insurance for you mother, so why don’t you just give us a call and we’ll be sure to do our best to help you out and answer any questions you may have. When you get a chance, give us a call so that we can try to determine why you’ve been declined coverage and then based on that, try to determine which company would be best for both you and your husband. What would be best term life premium quotes for me? 53 years female, good health condition..no heart problem, not a diabetic, no cancer, i am healthy. I need a term life 30 years, with a rider of waiver of premium and will be paid when disability strikes…. I just turned 53 last Sept 2016..
Any would make any recommendations? – How much coverage do you want? – What is our current height and weight? For this reason, why don’t you just give us a call when you have a chance and we’ll do our best to meet your needs. We’d love to help you out, but we’re certainly going to need to learn more about your husbands situation before we can make any type of recommendations. Why don’t you just give us a call when you have a chance and we’ll do our very best to serve you. I need to get insurance for my 87 year old aunt. She’s in good health. Unfortunately we simply don’t have any life insurance companies that we represent that will write new life insurance policies for those over 85 years of age. You may want to try “Googling” life insurance over the age of 85 and see if their are any other insurance companies that may be able to assist you. do you offer term life insurance for someone who is age 33 a convicted felon and currently on parole? We have yet to find an insurance company that is willing to offer term life insurance coverage to someone that is currently on parole. Now there are some insurance carriers that don’t specifically ask if someone is on parole, but if during underwriting, it is discovered, it has been our experience that the application will be denied. For this reason, we’ll typically recommend an accidental death insurance policy for someone that is currently on parole and then just have them apply for a traditional term or whole life insurance policy once they are eligible. That sounds good, just give us a call during are regular business hours. I have a United Services Life Insurance Company policy from the 1960s and can find no info on this company to see if this is a viable policy. Can anyone there help me? After doing a quick search it looks like their contact number is 800-424-2300. We would suggest that you give them a call directly to learn more about your policy. Would you rank Prudential or MetLife as the best life insurance company in the group for marijuana users? Great question. Be on the lookout for our response via email. Sounds good, just give us a call at and we’ll be more than happy to help. Who offers the best life insurance for someone dealing with high blood pressure? Your best bet is to just give us a call and we’ll run the numbers for you. If one were interested in working for your company would one have to be a licensed insurance agent or simply trained by your company to know the differences in the companies represented and their product offerings? In order to sell life insurance for TermLife2Go, you would first need to be licensed in all 50 states. From there you would also need to be well trained on the nuances of life insurance underwriting practices and how they would apply to dozens of different insurance carriers. For this reason, we typically find that our best “new hires” have a minimum of 3 years selling life insurance prior to working for us here at TermLife2Go. Do you have anything to say about Mutual of Omaha? Review? We currently list Mutual of Omaha as one of our Top 10 No Medical Exam Life Insurance Companies (https://termlife2go.com/top-10-best-no-medical-exam-term-life-insurance-companies/). Within this article you will also see a link to our review of Mutual of Omaha, spoiler alert!!!…. We really like them! I am faced with a life changing decision. My mother took out a life insurance policy 30 years ago. she has paid over 50,000 dollars into the policy. The cost of the policy is over $536,00 a month. She is a retired teacher, and can not afford to keep paying this amount. She has tried to get the insurance company to change the policy so she wont lose her investment.. Please let me know what can she do to not lose all she has put into the policy The company is Lincoln National Life Insurance Company in Greensboro, NC. PLEASE HELP I DONT KNOW WHAT TO DO! we need to keep the policy to help with cost after death. Without knowing the exact specifics of your mothers insurance policy, it would be impossible for us to responsibly comment on what your mother can and should do regarding her policy. That being said, we would recommend that you give Lincoln National a call again, and ask them specifically what they would recommend that your mother do. After you have their advice in hand, then give us a call and we’ll see if we provide a better solution to your problem. Previous Post: Can I Buy Life Insurance on My Mother?